Please Note: All Directives listed below are subject to change by the Council, following a consultation with the Fleet. Please check this thread regularly for updates and changes. Fleet Conduct - The Prime Directive. The most important directive in this fleet is to have fun and treat everyone with respect. The voice of every member is important, whether a lowly Ensign or Chief of the Fleet. Everyone should feel that they can have their say and they are not being ignored. 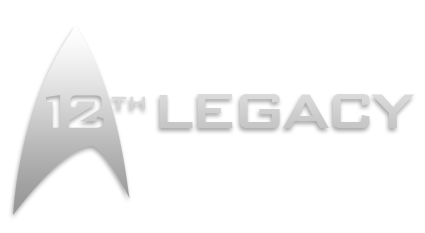 The 12th Legacy is a family friendly Fleet and as such we ask all members and guests to please keep conversations and posts respectable for a family environment within the forum and in any 12th Legacy In-game chat channels. Fleet Conduct - Memberships with other Fleets. We're all a community and may choose where and with whom we want to play games with. No restriction will be placed on being a member of another fleet with the exception of Officers of the 12th Legacy Fleet. Officer candidates (Captain or above) will not be allowed to hold an officer equivalent rank in another fleet, but may still be a member. Star Trek Online - Acceptance of Characters. At this point in time, the 12th Legacy accepts any STO Characters into the Main Federation and Klingon Fleets until the in-game membership limit is reached. Once this limit is reached a fleet meeting will be held to discuss whether or not to start a house keeping process to purge any inactive members to make way for new members or creating an alternate fleet. Star Trek Online - Fleet Resources & Probationary Periods. Fleet resources will be available to new members who have passed the 14 day probationary period, this is a mandatory process in order to protect our investments for the 12th Legacy members. It may be required for items stored in the Fleet Bank that are of low importance to be sold and with the earnings used to buy resources that benefit the fleet or in game fleet asset progression. Reporting & Handling of Issues. We take any reported issues very seriously and will address any issue with the utmost importance. These issues will be handled on a case by case basis by the council and they will act upon these issues reasonably with regards to the severity of the issue. Cases may be presented to Any Command Member via Private Message (PM). No active members can be removed from the Fleet without Council approval, however a member may be placed at Ensign rank until an investigation has been concluded. Activity Checks are not required at this time, but may be enacted if the Council decides at a later date. Periodic "house cleaning" may occur every 6 months, or sooner if deemed necessary by the Council. Characters that have been inactive past the 6 month period will be removed from the In-Game Fleet, and their forum account removed from the branch they are registered to.